A new addition to the RAZ-IR® family, the MAX thermal camera is a simple and intuitive infrared camera that works with just about every application. The rugged RAZ-IR MAX® infrared camera is a robust imaging solution for industrial and professional environments (this is one tough cam). The simple 3 button control scheme and user friendly onscreen menus make the RAZ-IR MAX® an easy tool to use right out of the box. Powerful features like digital image storage, CCTV and thermal image fusion, multi-spot radiometric temperature measurement (up to 250C), AUTO-FOCUS and voice recording are all at your fingertips. An innovative design allows you to use standard or rechargeable AA batteries instead of expensive proprietary batteries greatly reducing your down time and consumable expenses. 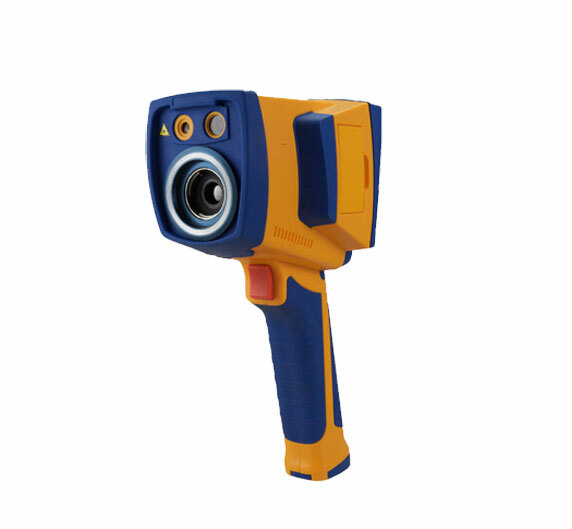 The newest RAZ-IR® model combines a powerful feature set, razor sharp thermal imaging, durable construction and a low price point. We say this thermal camera is loaded to the MAX! 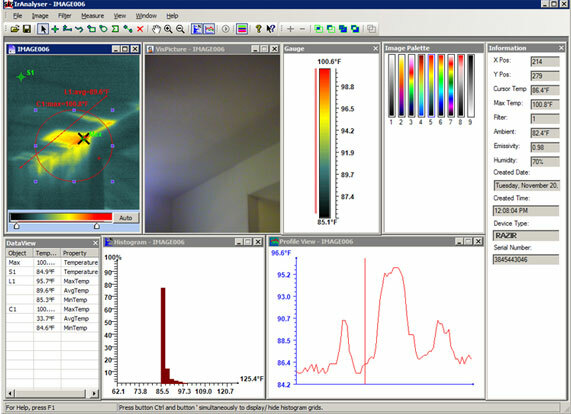 Explore IR applications and features of the RAZ-IR MAX® to find out what it can do for you. Intelligent thermal camera design means easy operation! Large 3.6" LCD screen with Crystal Clear Technology ensures razor sharp imaging that is easy to see in the most demanding environments. More about the Large Screen 2GB Removable SD card and internal image storage options. 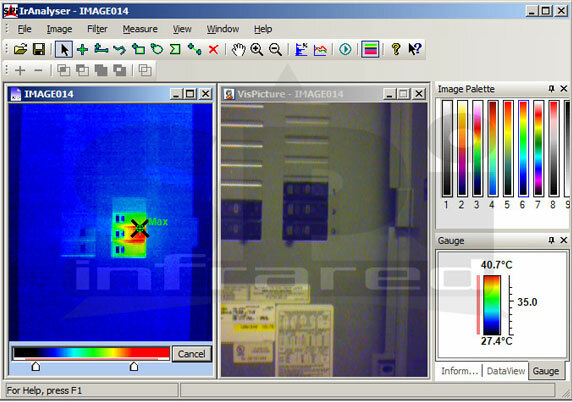 Thermal/visible images (JPEG format) and voice comments are stored on the SD Card or internally for easy download. Operates on Standard AA disposable or Rechargeable batteries (NOT expensive proprietary batteries). Standard batteries means you will never be without power and will reduce your consumable costs. More about Standard Batteries True second generation advanced AUTO-FOCUS technology. Sharp detailed images are just a button push away. Use auto focus or manual focus based on your needs. 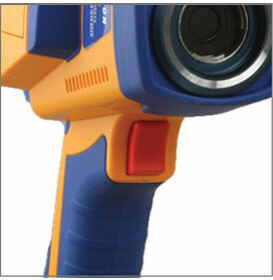 2.0 Megapixel CMOS camera provides high resolution visible images alongside your thermal images. Voice annotation lets you record voice comments in the field and attach them to a thermal and visual image. Now you can keep all your notes organized for later report generation. This model is a new addition to the product family. This means you are getting the most up to date technology securing your investment for years to come. Fusion Technology overlays the thermal image onto the 2 megapixel CMOS visible image for sensor fusion. Control the amount of blend to best highlight the target area. The World Wide Choice of professionals. Now shipping to destinations around the world. Our Export Team can assist you in international shipments. "The MAX is great because it's so simple to use " - Bryan K.
The RAZ-IR® family of infrared camera solutions now has a big screen! In response to the needs of industrial customers, the new RAZ-IR MAX® thermal imager now boasts a large 3.6" LCD display. Industrial applications of thermal imaging technology often include inspections in cramped facilities and hard to reach places. Additionally, service personnel are often laden with tools and safety equipment required for facility maintenance. The last thing you want to do in this environment is squint at a tiny screen. The sharp TFT LCD screen on the RAZ-IR MAX® makes one handed operation a snap in even the most demanding of applications. 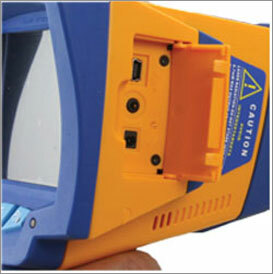 Spot problem areas quicker and more accurately with the large LCD screen. Brilliant full color imaging is yours with the new RAZ-IR MAX®. The RAZ-IR MAX® connects to your equipment through universal standard connection ports. Need to run off of vehicle power? Need new batteries in the middle of nowhere? Do you want to plug the camera into the wall for extended analysis? No Problem! Power the MAX® through rechargeable or disposable AA batteries, 12VDC external power or through 110VAC wall power. Want a really big screen view? Need to present your thermal report to a customer or superior? Easy! Connect the MAX® to common monitors and TV sets using the NTSC video output port. The NTSC video format is the standard format used by your TV set. If you need it the MAX® can even output PAL Worldwide video standard. Time to connect to your computer? The MAX® speaks PC using the USB (Universal Serial Bus) connection on every computer. Simply plug the MAX® into your PC and your ready to go. You can also download images by directly inserting the SD memory card into your PC. If you just want the pictures in a hurry you can even print the JPEG format images directly to a memory card enabled printer from the MAX® SD card. The MAX® Connects! The RAZ-IR MAX® is the result of careful analysis and feedback from existing thermal camera users. The need for image storage options has been addressed on many levels. 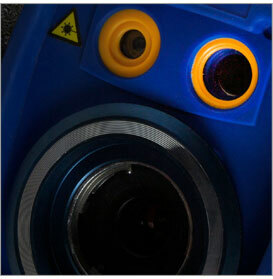 Removable storage is a must on todays infrared imagers. The RAZ-IR MAX® uses industry standard consumer SD memory cards that are readily available at common electronics retailers worldwide. The MAX® comes with a 2GB SD card, which can store thousands of images, to get you started. You can use this card for everything but you also have the option of obtaining additional cards for backup. Some people use a different card for each job. The MAX® is all about options so you are not limited to just the SD card. In the real world things happen. Sometimes you lose your card or forget to pack it for the job. Occassionaly, cards even become corrupt and unusable. Never fear the MAX® will not let you down. In addition to the SD Card image storage the MAX® also has internal UFLASH image storage that lets you save images (thermal and visual) as well as voice comments internaly with no SD Card required. With the RAZ-IR MAX® you will never have to say "I can't finish the job". You see these three buttons? That's all it takes to unleash the power of the RAZ-IR MAX® thermal machine. Truly designed for the working professional, the MAX® never lets its controls get in the way of completing the job. Like any good tool the MAX® feels good in your hand and lets you get the work done with a minimum of effort. 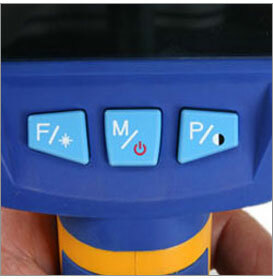 All the advanced functionality of the MAX® is accessed by way of these buttons and the intuitive onscreen menus. There is even a users manual built right into the camera that you can access at any time with, you guessed it, the touch of a button. Auto Focus and Manual Focus are also controlled from the MAX® buttons so you truly have a device that you can operate with one hand. Does it make sense to have an ultra exotic thermal infrared sensor sitting next to a low quality low resolution visual camera? Of course not. The thermal image is only half the job. A professional report includes both thermal and visual light images of the problem areas. Many cameras look at the visual camera as a cheap afterthought. Not the MAX®. This system boasts and ultra clean 2 Megapixel video sensor. The MAX® automatically saves brilliant visual light images alongside the thermal images for easy report generation. Buying a thermal camera with a low end visual camera is like doing half the job. Don't settle for half a camera get the MAX®. You wouldn't think that batteries are a big deal, but the designers of the MAX® do. 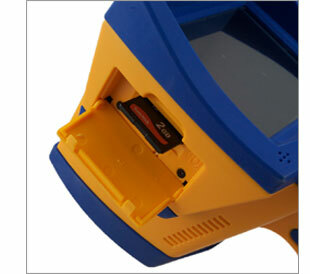 Traditionally, most thermal infrared camera systems come with proprietary batteries that are unique to a particular manufacturer and usually to just one model from that manufacturer. If you only have one place to buy the batteries and they aren't being produced in mass quantities that means you are paying too much for batteries. Many thermal camera manufacturers charge $250+ for a rechargeable battery! The MAX® lets you decide. It is recommended to use off the shelf rechargeable AA batteries as the primary power source. This is the greenest way to go. But if you are stuck in a bind, thermal imaging is only as far away as the local drugstore. 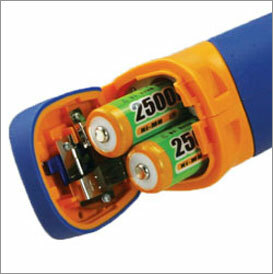 The MAX® can operate on disposable AA batteries that you can get anywhere. Want some extra punch from the disposables? Try the new Lithium Ion AA batteries. Want to charge the batteries in the MAX®? No problem. Charge externally? No problem. Its easy when its MAX®! AUTO-FOCUS technology has long been available on consumer digital and video cameras but it is a relatively new feature for thermal cameras. The new RAZ-IR MAX® leverages years of experience in thermal infrared auto-focus to bring you the next generation of infrared autofocus. Unleashing this powerful feature is as simple as pushing a button thanks to the intuitive onscreen menu design of the MAX®. The focus mode gives you three easy options; Focus Near, Focus Far and Auto Focus. You decide which is best for your particular application. Internal focus also means that you can comfortably use the MAX® camera in the field with just one hand. No more reaching around for the manual focus and hunting back and forth for the perfect focus. Now, you can just push a button and zoom right into focus. If you need to adjust the focus its just a simple button push as well. RAZ-IR MAX® Second Generation AUTO FOCUS means less time fiddling with the camera and more time getting the job done! Accurate temperature measurement is the heart and soul of a good thermal infrared camera. With the RAZ-IR MAX you get Radiometric Temperature Measurement. Not only do you see visually what is hot and cold in the image but you can also read the temperature of any point in the scene. Simply put the crosshair on the spot that you wish to measure and the MAX does the rest, in real time. The crosshair is moveable so you can keep everything in the scene that you want to and move the crosshair to the desired point of interest for accurate temperature measurement. If you want to get even more accurate data the MAX allows you to adjust emissivity, ambient temperature, distance to object and even humidity to further calibrate the temperature data. Once you find a problem push a button and save the image. Download that image into the Analyzer software (included with every MAX camera) and a world of further analysis options opens up. Every pixel in every image is fully calibrated and contains radiometric temperature data. 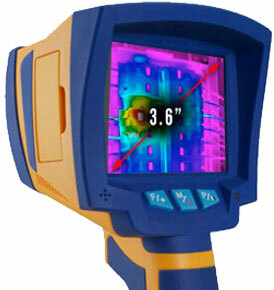 The MAX is a full screen radiometric thermal imager. Complex temperature measurement functions such as multiple spot, bounding box, Min/Max/Average, histogram, Delta T and more are easy to implement in the Analyzer software package making your reports look professional and comprehensive. The MAX comes standard with a temperature range of up to 482 degrees so you can measure a wide range of conditions typically found in industrial settings (if your electrical panel is over 482 degrees there's definitely a problem). The MAX recognizes that each situation is unique. Need to measure higher temperatures? No problem, the MAX is available with an optional high temperature calibration that lets you measure temperatures up to 662 degrees. Thats Hot!